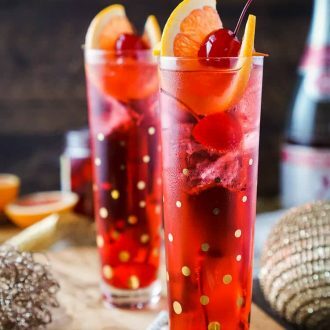 This Champagne Shirley Temple switches out soda for some bubbly for an adult twist on the classic drink recipe! This is a great New Year’s Eve drink and perfect for other parties throughout the year! Just a few ingredients and you’ll have a classy cocktail worth celebrating with! How’s everyone doing? Have you recovered from your Christmas Coma, yet? I know Matt and I started feeling it around noontime yesterday, we were getting antsy and ready to get moving again. So it was back to work today, but work doesn’t seem so bad after a nice 4-day break. However, Maine has its first big storm of the season hitting tomorrow, which for some reason means we all need to run out and buy EVERYTHING because the world might end. Okay, really it’s just the water, milk, and coffee brandy (that’s the champagne of Maine, you know) that seem to fly off the shelf before a storm, but it always means a crazy amount of people out and about in case we get snowed in or lose power. I had to go out and get some supplies and ingredients for this week’s posts and when you compound the storm, school vacation, and the post-holiday returns, it was NOT a good idea on my part. But I survived and got home in time to make, shoot, and now share this fun cocktail that’s perfect for new years eve! 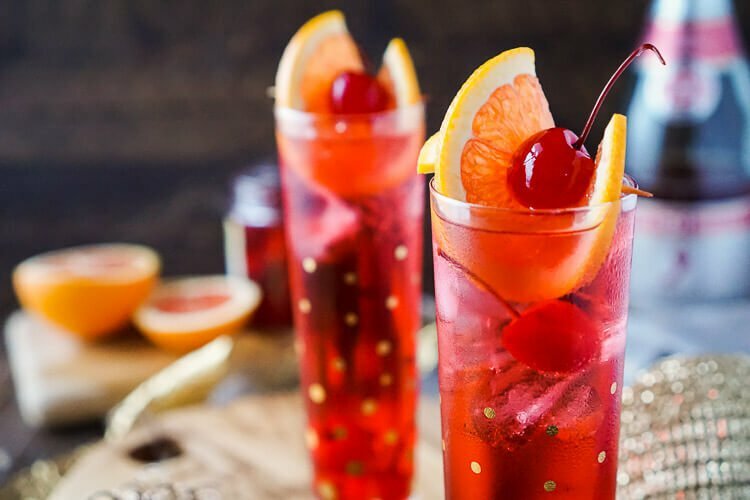 A Shirley Temple is a non-alcoholic mixed drink traditionally made with ginger ale, a splash of grenadine and garnished with a maraschino cherry. What Is a Dirty Shirley? A Dirty Shirley is a Shirley Temple made with vodka. Drinkware: I love serving holiday cocktails in fun drinkware, consider gold glassware for NYE or silver for Christmas time! Serving: Make these in a big batch and serve out of a pitcher or punch bowl! Straws: Go a little black tie fancy or extra fun with some paper straws! Presentation: Add extra pizazz by dressing up your glasses with fruit and drink picks! Party Supplies: It’s NYE, make it extra fun with decorations, noisemakers and more! Those who don’t like the really hard stuff. People who want something classier than a beer or wine cooler. Those who want something more exciting than plain ole’ champagne. Individuals who don’t drink much, but want something light and fun to ring in the new year with. 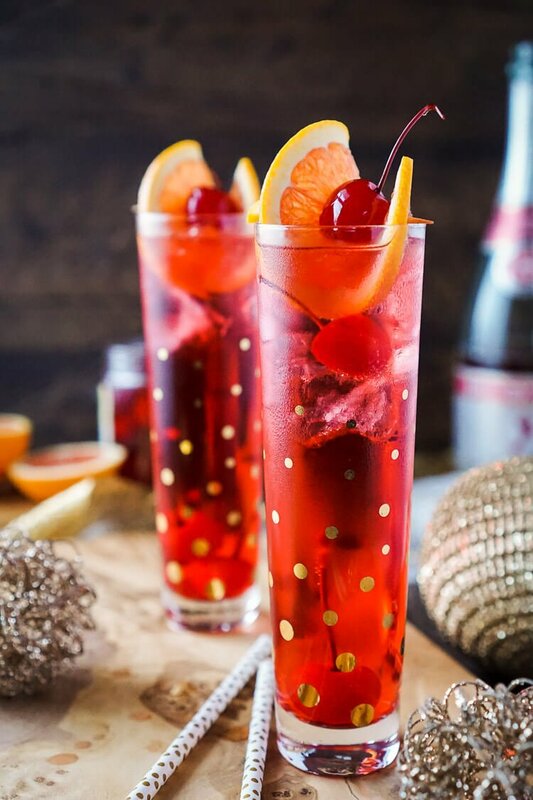 I really love how simple it is and the sweet bubbly notes of champagne with that yummy grenadine and cherries make it such a fun little drink! Serve it as a signature drink at a party or make one just for you! 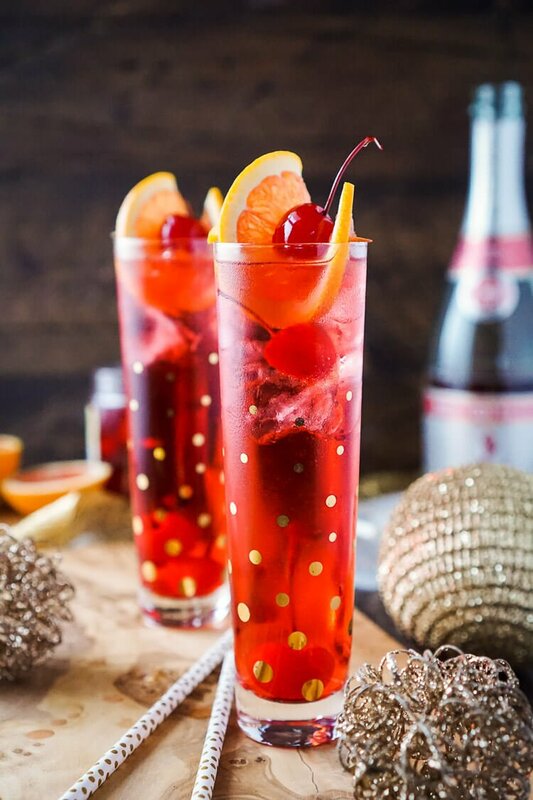 Pin this Champagne Shirley Temple for Later! 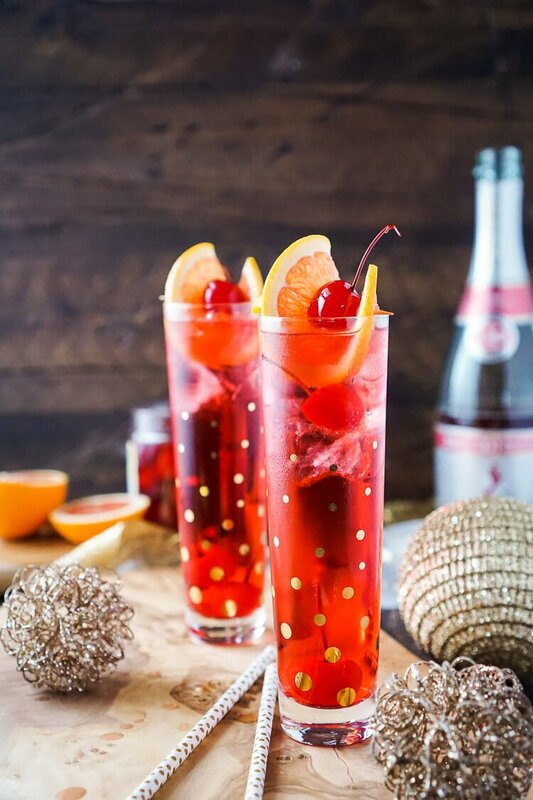 This Champagne Shirley Temple switches out soda for some bubbly for an adult twist on the classic drink recipe! This is a great New Year's Eve drink and perfect for other parties throughout the year! Just a few ingredients and you'll have a classy cocktail worth celebrating with! 8 oz. pink Moscato champagne regular champagne is fine. 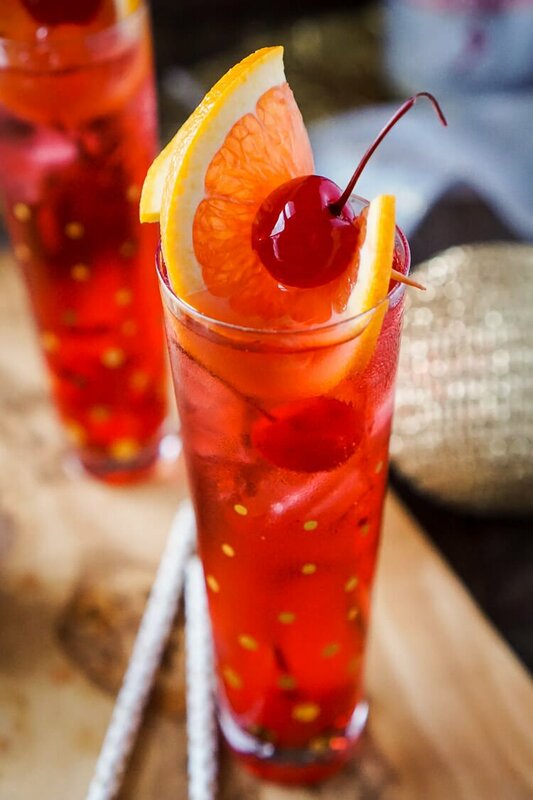 Fill glass halfway with crushed ice and pour in champagne, add grenadine and garnish with orange slice and cherries. Serve with a straw.